There is no substitute for scheduled onsite IT support. Our engineers proactively keep systems healthy, work with your team, and maintain clear communications about the state of your IT environment. We assign a primary engineer to address user requests and solve the technology problems that keep your team from getting their work done. Over time, this assigned engineer becomes highly knowledgeable about your systems and understands the way your organization uses IT. This means your engineer will learn which systems are critical and when, and also which systems require a little more “care and feeding” to keep them running smoothly. Plus, if your primary engineer is away for any reason, our deep bench of skilled engineers can fill in when needed. Onsite IT support works best for proactive maintenance and for troubleshooting issues that aren’t time-sensitive. With Scheduled Support, your lead engineer will work from our defined maintenance task list, and also work on any outstanding tickets that need to be resolved. These tickets could be responsive support issues that you reported to the Service Desk between visits, or small projects that can be completed piece by piece over multiple visits. 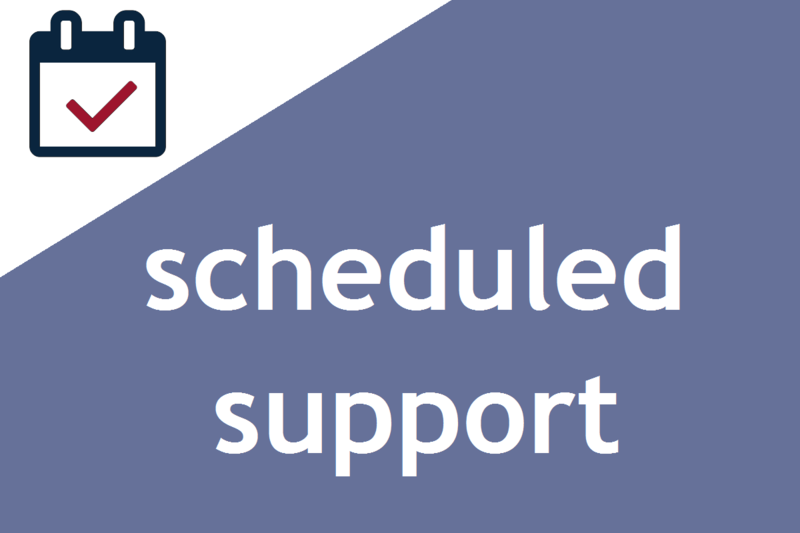 Scheduled Support provides recurring visits of four to eight hour blocks of time. You can have an engineer or technican visit weekly, monthly, or on any other schedule that best fits your volume of work. But for even our smallest clients, we recommend a minimum of every-other-month scheduled support to ensure that your systems are being regularly reviewed and proactively maintained.